Empire Kiosk, Sierra Leone. Expect to see a shop within a shop. Ben Lloyd travelled to Sierra Leone in 2011. 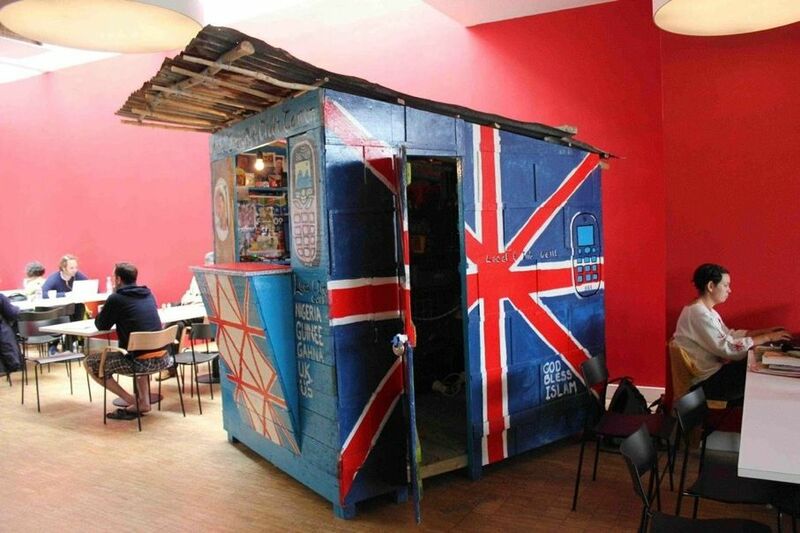 Empire Kiosk is an appropriation of the multi-coloured kiosks he saw in the many towns and villages he visited, made from humble materials and painted with various images of mobile phones, household goods and cultural flags. My Granddad was a civil engineer in Ghana way back, he and my Gran lived there on and off for maybe 6 Years. He died a long time before I had a chance to meet him but my Gran told me stories that intrigued me. In 2010 I began emailing people in Ghana about possible volunteering opportunities and on receiving little response I widened my search. I searched on a map and catching my eye was Sierra Leone, which on a map wasn't so far away from Ghana. The most inviting and hopeful email by far was from Binta Jalloh, founder of Binta's Angels' Network. Binta invited me to be a volunteer teacher in Foronaya School, Koinadugu District. I got excited, spread the word, got sponsored, got injected and headed off. During my time there the Kiosks stood out for their colour, creativity, eclecticism, entrepreneurialism and the way they made sense of the world."